Whether it's in-store, on our favorite shopping sites, on Instagram, on Pinterest, or on celebrities and street style set, if there’s one shoe style we literally cannot escape this season, it’s satin slide sandals—and we’re not mad about it. From a $20 pair from Forever 21 to some investment-worthy Gianvito Rossi picks, there’s no brand that’s skipping summer’s must-have style, and we can totally see why. The shoes combine the luxury look of satin with the comfort of flat slides and provide an everyday option that will have you wondering how you ever lived without them. So, naturally, we’ve rounded up our favorite pairs—25 of them—because there were simply that many good ones we had to share. Shop our picks at literally every price point below! The lilac colorway you just saw might have sold out, but these beauties are still in stock (for now)! The contrast of white satin with wood is too good. This slight wedge makes all the difference. For this price, you can buy all three of the amazing colors these come in. No one does statement shoes like Jeffrey Campbell. This embellished pair looks literally 10 times its price. Who can say no to anything marshmallow? We love these for summer. Barneys's in-house brand is one of our favorite go-tos for moderately priced shoes. In case you really want to treat yourself. A pop of red is always a good idea. 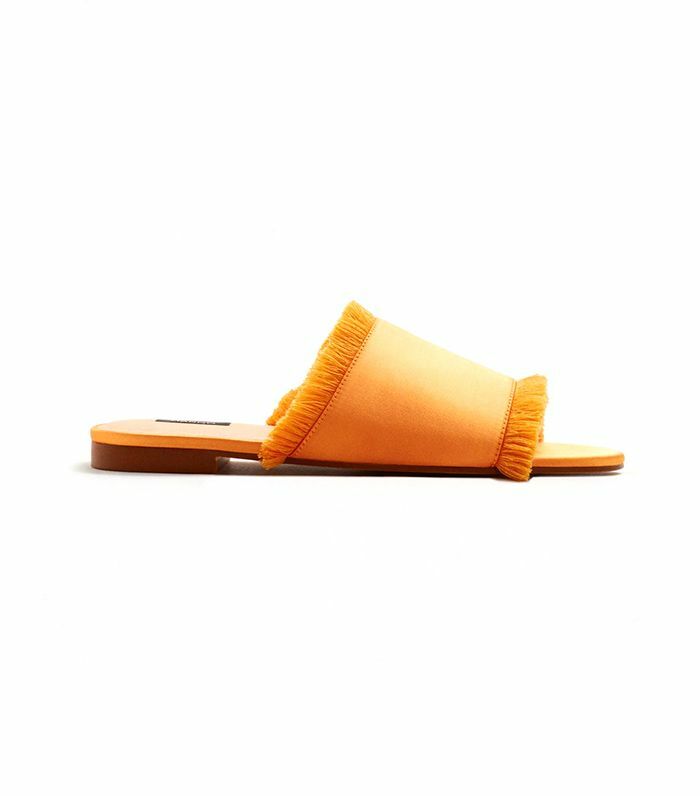 These padded slides are comfortable yet chic. Let this color speak for itself. We meant it when we said literally every brand is making these. Mustard is (unexpectedly) one of the more prevalent colors we've been seeing this trend in. These will look so cool with an all-white outfit. Add velvet to satin and you get even more amazing shoes. We're into these multicolored jewels. We couldn't help but pick a second pair from Mango —they're that good. Gray is the perfect choice for those trying to branch out from all black. See the other Forever 21 sandals we're loving right now. These beauties also come in white and hunter green, and boy, is it a tough choice. If you don't own these Zara favorites yet, you should definitely pick up a pair now. Want more summer style tips? Check out these seven easy swaps to make warm-weather dressing a breeze.